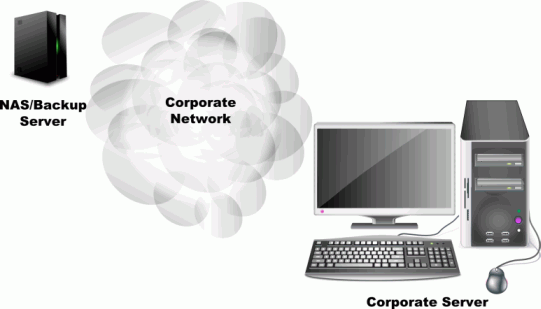 In today's business environment, both large and small offices rely on computers and corporate servers for their core business activities. While this means greater efficiency for day-to-day business, it also means that your company's productivity depends more heavily on the reliability and accessibility of your data and applications. Quite often, the failure of a single business crucial server can result in catastrophic losses to the company. It is not uncommon for there to be a complete loss of productivity while the data and functionality of the system are restored. There are many ways to reduce the risk of catastrophic hardware failure. But the most tried and true safeguard against data loss is a regular data backup. Regularly backing up your company's data won't reduce the risk of hardware failure-but it will drastically mitigate the damage caused by a server or hard drive failure. Having a solid data backup plan in place makes it possible to restore a failed server to full operation in a matter of hours rather than a matter of days. This alone greatly reduces the costs of restoring business operations, both in terms of lost time for your employees and billable hours for data recovery IT services. The benefits of a regular business data backup plan are obvious. Yet many business owners continue to be hesitant to invest the time and money into a proper backup plan. In past decades, small business owners may have been right to shy away from the costs of a robust, sophisticated backup system. A data backup plan is like insurance for your stored data-and with older systems and software, the "premiums" you pay have the potential to outweigh the value of the protection you receive. But with a modern network attached storage (NAS) device and an intuitive, professional backup program like R-Drive Image, establishing and executing a proper data backup plan is incredibly easy and inexpensive. This article will prove that by showing how to create a data-consistent backup plan for a small-size corporate server. This example procedure shows the capabilities of R-Drive Image as well as the intuitive wizard-style interface. The backup plan established here is suitable for a small business IT system. After completing the steps, you should be able to easily adapt the same methodology to meet your own business backup needs. Before we begin with the procedural steps, we'll briefly define the configuration of the system we are backing up and the parameters of our automated backup plan. When creating a backup plan, it's important to consider the disk setup on the server or computer that is being backed up. A typical disk setup includes a system disk and a data disk. These may be comprised of two logical disks on a single physical hard drive, two separate physical hard drives, or separate volumes in a RAID setup (including RAID 0 for the system disk). In any case, it is necessary to back up both the system disk and the data disk. For both disks, it is best to back up the volume on a disk level, rather than on an individual file basis. Backing up using an image of the entire disk is faster, more reliable, and preserves the entire file/folder structure on the volume. This is important not only for the system disk, which requires certain files to be in the proper folders, but also for data disks, since many databases have complex and meaningful file/folder structures. In this example, we'll be backing up two logical disks on the same physical hard drive: the system disk (C:) and the data disk (D:). In this example, we will schedule the backup to run unattended after hours and on weekends. This will ensure that the backup does not interfere with performance or data accessibility during business hours. Monthly full backup run the first Sunday of the month at 2PM. Weekly differential backup run every Sunday at 5PM. This backup plan makes it possible to roll the system back on a weekly basis for the last three months. For example, if there is a catastrophic system failure on Tuesday, you'll only need to redo any changes that have occurred since the last backup on Sunday at 5PM. This means you'll only lose about 2 days of work. The most you stand to lose is 7 days of system configuration changes. For example, if you have a system disk failure on Sunday before 5PM. Given that system changes occur infrequently, this is an acceptable level of risk. Monthly full backup the first Saturday of the month at 5PM. Daily incremental backups run at 11PM on business days. This backup plan saves the current data state once a day, making it possible to the roll back the data on a daily basis for the last three months. The backup schedule is set for Saturday, rather than Sunday, so it does not overlap with the system disk backup schedule. With this backup plan, you will never lose more than a day's worth of data - if you save a file on Tuesday morning and there's a system crash that afternoon, you'll be able to roll back to the files you had on Monday night. If you save a file on Tuesday night before 11PM and there is a system crash the next morning, you won't lose anything. Full backup A file that contains a complete image of an entire disk. Pros: This is the only file needed to recover an entire disk. Differential A file that contains the difference between the current disk data and the last full backup. Pros: Smaller in size than a full disk backup. Cons: Typically larger than an incremental backup. 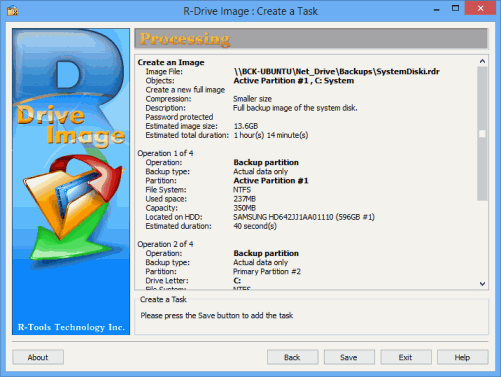 Requires one differential backup and one full backup image to restore a disk. Incremental A file that contains the difference between the current disk data and the last backup (full, differential, or incremental). Pros: Smallest size, compared to a differential or full backup. Cons: May require multiple incremental/differential backup images in addition to one full backup to restore data. If any one of the incremental backup files becomes corrupted, data stored in later incremental backup files cannot be restored either. The safest place to store backup data is on a remote backup server that is physically located offsite. This removes the risk of both your operational server and your backup server being damaged by a fire or natural disaster in your building. The second best option is to store the backup data on separate hardware in the same building. This protects you from data loss caused by hardware failure - if you have a backup stored in the same physical disk as the disk that's used for day-to-day business, you'll lose both sets of data if the hard drive has a physical failure. For a remote backup server, it's not necessary to invest in a high end computer or server. An inexpensive, though reliable network attached storage (NAS) device will do. You can find a NAS device to meet your needs at practically any retailer that sells computers or business IT equipment. Note that many NAS devices come with support for internal RAID volumes. For backup purposes, make sure you use a RAID level that incorporates redundancy or fault tolerance, such as RAID 1, RAID 4, RAID 5 or RAID 6. Avoid stripe sets (RAID 0)-if one disk in a stripe set fails, all data will be lost. 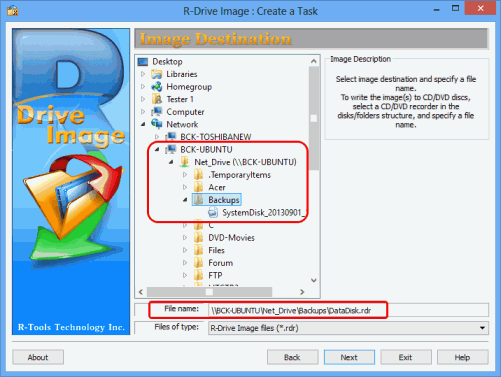 R-Drive Image is compatible with any backup server OS that supports the SMB network protocol. This includes, but is not limited to, Windows, Mac OS and Linux. Most NAS devices run a customized Linux OS distribution. In this example, we will back up to a remote server on the network (BCK-UBUNTU). After completing a scheduled backup, an email report of the backup operation results will be sent. For examples of email reports, see the Mail Notification Examples section at the end of this tutorial. The first part of the system disk backup is a monthly full backup that runs the first Sunday of the month at 2PM. 1. In the Action Selection panel, click Scheduler / Create a Script. 2. In the Scheduled Tasks panel, click the Create a task button. 3. 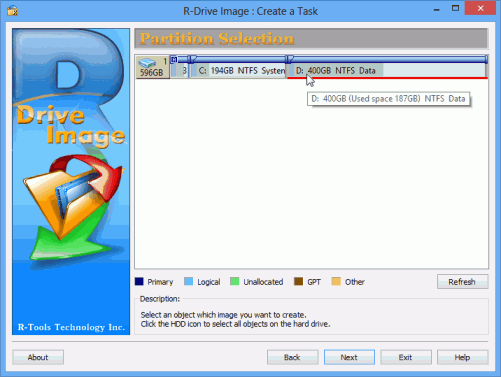 In the Partition Selection panel, select the system partition that will be backed up. In this example, the system partition is C:. 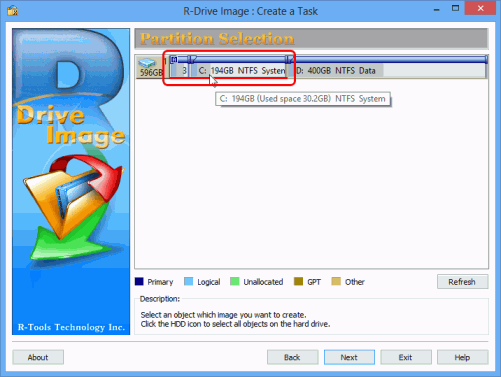 When creating a system disk backup for Windows 7 and later, don't forget to select the small active partition for the system loader in addition to the system disk. Earlier Windows versions don't have such a partition. 4. In the Image Destination panel, select the image destination and file name. In this example, we are choosing a network backup server BCK-UBUNTU and the Backups folder as the destination. You may be prompted for a username and password to access a folder on a network drive. 5. Specify the backup set parameters in the Imaging Mode panel as shown. For Maximum number of backup sets, choose 3. Choose Create a new full image for the imaging mode. For more information on the rest of the parameters, see R-Drive Image online help topic: Backup Sets. 6. Specify the necessary parameters on the Image Options panel as shown. 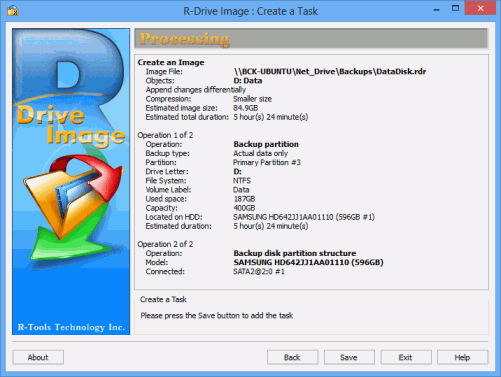 For more information on the rest of the parameters, see R-Drive Image online help topic: Image Options. 7. Specify the required parameters on the Backup Options panel as shown. 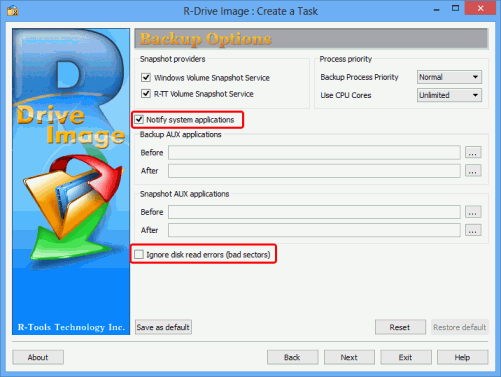 For more information on the rest of the parameters, see R-Drive Image online help topic: Backup Options. 8. Specify the necessary parameters on the Time/Event panel as shown. 9. Specify the required parameters on the User/Password panel. 10. Specify email notification options on the Mail Notification/AUX Applications panel as shown. Before proceeding, you can test your email settings by clicking the Test mail account… button. R-Drive Image will send a test email using the specified settings. 11. Verify the task parameters on the Processing panel and click the Save button. To change a parameter, click the Back button to return to the necessary panel. If you clicked Save, the scheduled task will appear on the Scheduled Tasks panel. The next part of the backup plan is a weekly differential backup. This backs up only the data that has changed or been added since the last full backup. These backup files are smaller in size and do not take as long to process, which makes them more suitable for weekly backup operations. 1. Click the Create a task button on the Scheduled Tasks panel, select the system partition on the Partition Selection panel, and select the image destination with the same file name on the Image Destination panel, as you did for the full system disk backup. 2. Specify backup set parameters on the Imaging Mode panel. 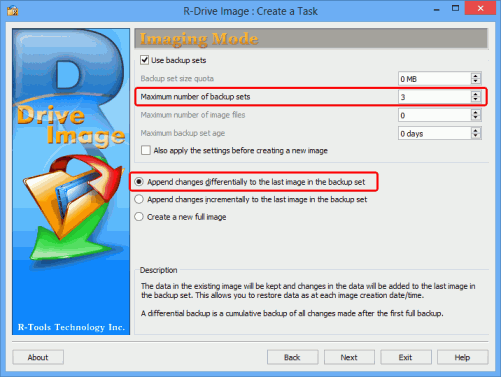 Set the Maximum number of backup sets to 3, and select Append changes differentially to the last image in the backup set. 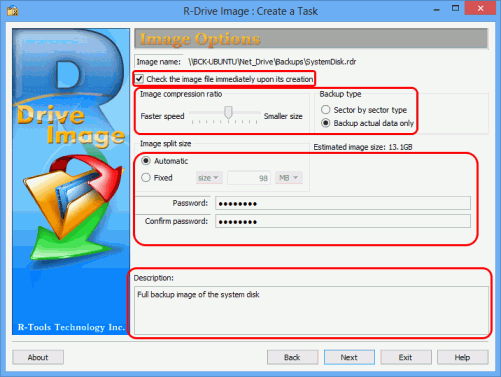 If you protected the full backup disk image with a password, R-Drive Image will ask you to enter it. 3. Specify the necessary parameters on the Image Options, and Backup Options panels, as you did for the full system disk backup. 4. Specify the necessary parameters on the Time/Event panel. 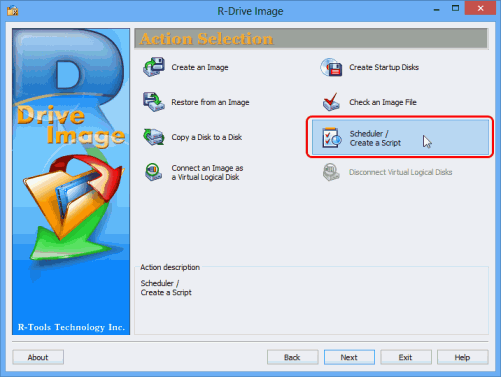 Ensure that the Start time does not overlap with the monthly system disk full backup. 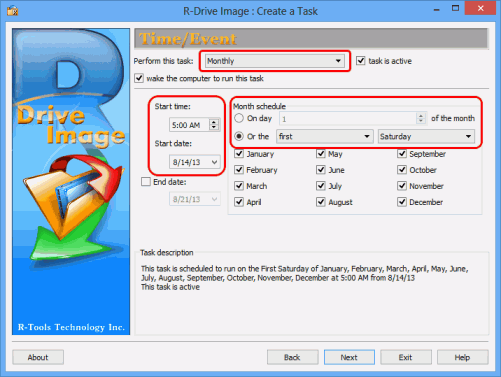 In this example, we have chosen 2PM or the monthly backup and 5PM for the weekly backup. 5. Specify the required parameters on the User/Password panel. 6. Specify the necessary parameters on the Mail Notifications/AUX Applications panel, as you did for the full system disk backup. Change Custom subject: to Server1: differential system disk backup. 7. Verify the task parameters on the Processing panel and click the Save button. The scheduled task will appear on the Scheduled Tasks panel. The procedure is very similar to the full system disk backup, except it backs up the data partition (D:). 1. 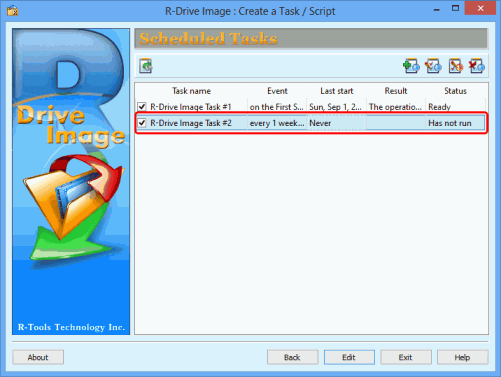 In the Scheduled Tasks panel, click the Create a task button. 2. Select the data partition (D:) on the Partition Selection panel. 3. Select the image destination and file name on the Image Destination panel. 4. Specify backup set parameters on the Imaging Mode panel. 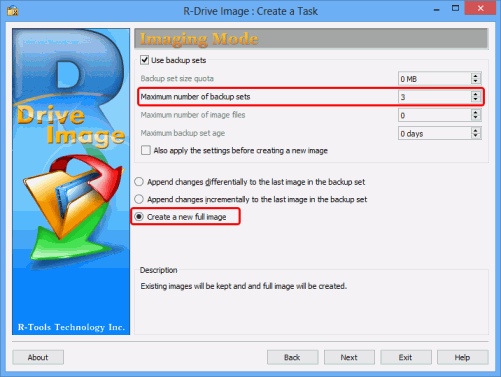 Set the Maximum number of backup sets to 3, and select Create a new full image. 5. Specify the necessary parameters on the Image Options, and Backup Options panels, as you did for the full system disk backup. 6. Specify the necessary parameters on the Time/Event panel. 7. Specify the required parameters on the User/Password panel. 8. Specify mail options on the Mail Notification/AUX Applications panel. 9. Verify the task parameters on the Processing panel and click the Save button. Again, this is similar to the system disk differential backup, except we are choosing the data partition (D:). 1. 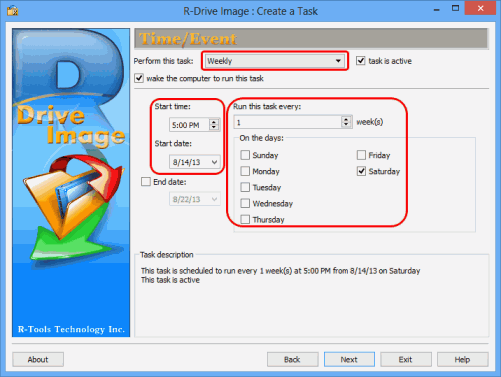 Click the Create a task button on the Scheduled Tasks panel, select the data partition (e.g. D:) on the Partition Selection panel, and select the image destination and file name (same as for the data disk full backup) on the Image Destination panel, as you did for the data disk full backup. 3. Specify the necessary parameters on the Image Options, and Backup Options panels, as you did for the data disk full backup. 6. Specify mail options on the Mail Notification/AUX Applications panel. An incremental backup includes the data that has changed or is new since the last full or partial (differential/incremental) backup. Individual incremental backup images are smaller in size than differential backups, which makes them more suitable for daily backups. 1. Click the Create a task button on the Scheduled Tasks panel, select the data partition on the Partition Selection panel, and select the image destination and file name (same as for the data disk full backup) on the Image Destination panel, as you did for the data disk full backup. Set the Maximum number of backup sets to 3, and select Append changes incrementally to the last image in the backup set. Your backup plan is now scheduled. You will now begin receiving notifications when backup operations complete. Read on for guidance on reading backup logs. where N is the number of the previous incremental or differential backup. Start of Backup Set 4. Backup Set 1 is deleted. This is an example of the file structure from one backup set. The beginning of Backup Set 2 is shown for context. You may delete daily incremental backups that were created between a full and differential backups without loss of data consistency. For example, after DataDisk_20130831_050000AM_8.rdr is created, you can delete DataDisk_20130831_050000AM_3.rdr through DataDisk_20130831_050000AM_7.rdr. 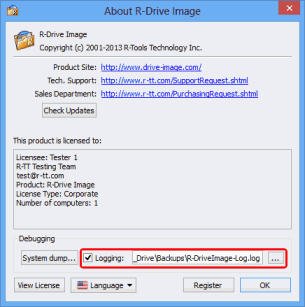 You can save a log file of R-Drive Image operations. To start logging, click the About button on the Action Selection panel, select Logging, and specify the file name and path. When a backup operation completes, R-Drive Image will send a mail notification. -a="\\BCK-UBUNTU\Net_Drive\Backups\SystemDisk.rdr" -p="******" -r="Full backup image of the system disk." -c="6" -u -check -bs -bs-num-b="3" -ms="mail.example.com:25" -ml="******" -ma="server1@example.com"
Creating a backup plan with R-Drive Image is quick, easy and cost-effective. With R-Drive Image, a dedicated backup NAS and some basic planning, you can easily protect yourself from the crippling expense and inconvenience of a catastrophic data loss. This example shows you how simple it is to create a proper backup plan. To customize a backup plan to suit your business needs, see the R-Drive Image online help for more details about all of the backup parameters available.